February 14th - Red and More Red! The Red Red Day! Both Valentine's Day as well as Chinese New Year fall on the same day this year - 14th of February. Both are symbolized by the color RED so here we are making lots of red greeting cards for these two important events. Whether you are a Chinese or non Chinese, have fun making these red greeting cards. 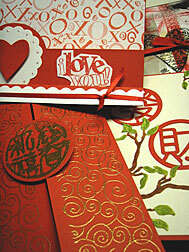 Make a Lunar New Year card for your Chinese friend or neighbor even if you don't celebrate Chinese New Year yourself. By the way, the Koreans celebrate New Year on the same day as the Chinese. So are the Mongolian, Tibetans and Vietnamese. Interesting! View and read more about these handmade Chinese greeting cards. There are three of these homemade greetings with template and simple instructions. A few Happy Valentines cards for browsing with instructions, love quotes and verses. Copyright ©2004 - 2010 FlorenceArt!, All rights reserved worldwide.